Almost every website/blog displays ads to earn for the work the work they put up and meet the costs of hosting, domain, etc. But, sometimes they can go way too far. Visitors can accept 1-2 ads per page but forcefully glueing 5 ads on every web page is just annoying. So, for that, I have gathered 4 most popular Ad blocker extensions for chrome. AdBlock is one of the most popular ad blockers extensions for Chrome. AdBlock blocks video ads, banner ads, pop-ups and other annoying advertisements. Just add this extension to Chrome and stop seeing those annoying ads. AdBlock also blocks YouTube ads providing ad-free videos. Adblock Plus is used by over 100 million devices and is excellent at what it does. Adblock Plus is quite similar to AdBlock and almost works the same way. It certainly lives up to its name. This Chrome extension blocks any and every ad. You can't whitelist any site. Adblocker Ultimate also blocks malware and tracking. Ghoster not only blocks ads but also provides security and enhances privacy. 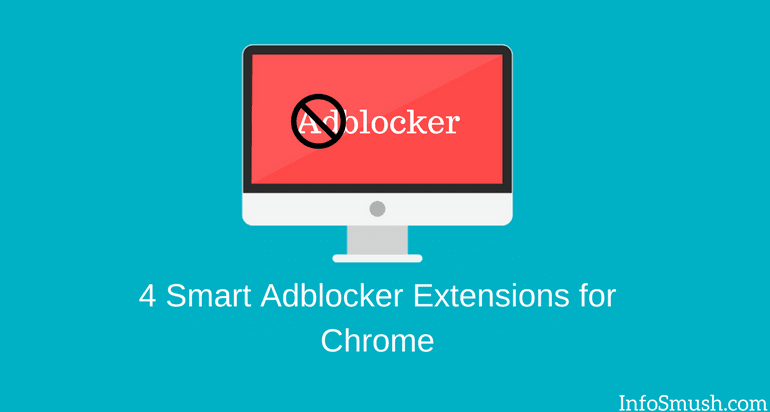 You can install these extensions from the Chrome extension store and block unwanted ads. Please whitelist your favourite sites/blogs because ads help them provide free content like the one you are reading. Which Adblocker extension do you use? Which one do you think is the best? Did I miss any other good adblockers?